Lily is my wildlife spotter. Last summer, while we were eating lunch, Lily was looking out the window. She very casually said, “There’s a fox in our backyard.” I thought there was no way a fox could be in our suburban backyard. But I turned around to look anyway, and … there was a fox! We saw him several other times that summer. Earlier this spring, Lily asked me, “Is that a crow in our tree?” I turned around to look. So when Lily told me in the middle of the afternoon that there was a deer in our backyard, I instantly looked out the window. 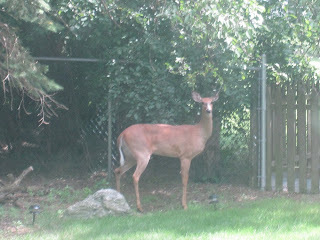 Our neighborhood has a lot of dogs, which were kind of freaking the deer out. I called the non-emergency number of our police station, (I already know our suburb doesn’t have animal control) and the officer who answered said that they were not equipped to handle deer. He advised to just leave the deer alone and let it leave at nighttime. The deer jumped the fence, and spent the afternoon resting behind our neighbor’s shed. The next morning, there was no sign of her. I was relieved, but Emmy had a harder time. She wanted the deer to stay. “But I LOVE the deer!” she said. I suppose we wouldn’t have to mow the lawn as often if the deer stayed around! 9 Responses to Oh, Dear, a Deer! Wow. What a beautiful deer! I'm team Emmy all the way on this one. I'd want to keep it too! That's so cool. I mean, around here the most wildlife we get are ducks and maybe a squirrel. Oh, and I actually saw a rat scurry across my back fence the other night…it just doesn't have the charm of a deer grazing delicately in your back yard. You know you're too close to the city when you consider vermin "wildlife". Yuck. Not only wouldn't you have to mow your lawn, but cut your bushes or weed your garden. A deer would take care of all that. 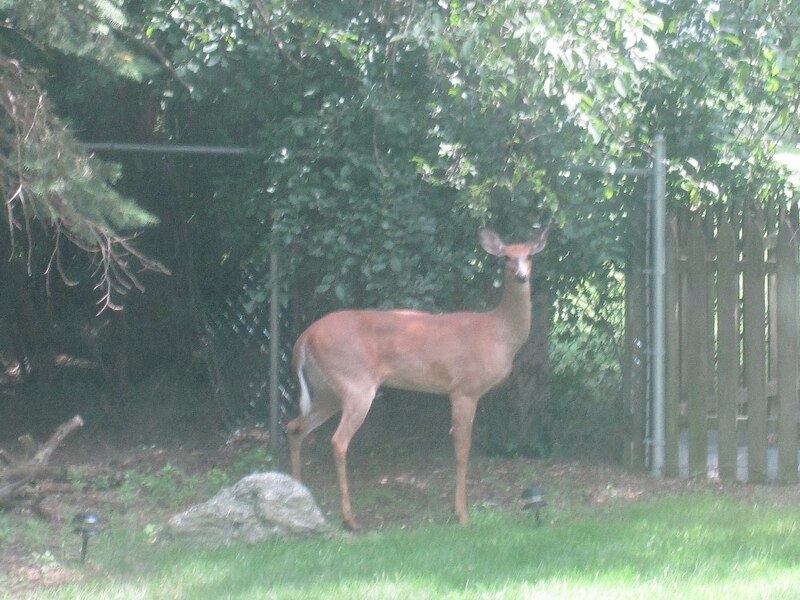 Trust my dad on this one…the deer have eaten his bushes, garden and most recently his hostas. It's crazy…But that is a beautiful deer! Wow, he's gorgeous. Wait, you said she. She is gorgeous. There are deer over by my parent's house and in high school, one ran into my brother's car. Like into the side of it as he was driving and the antlers skimmed my brother's arm (which was out the window). Weird. We have hawks and I always expect them to fly off with one of my kids which would probably be a bad thing. When we lived in your neighborhood we had raccoons from the forest preserve take up residence in our roof. If you need a good laugh, some day ask me how dad got rid of the raccoons. About 10 years ago the county had cages you could borrow to safely dispose of raccoons and other small animals. Naw, that's so cute. We don't get much cute around here, it's just snakes and spiders and lately alot of bats in the ceiling. The only cute we do get is a few green frogs and back when we had the mango trees a couple of curious possums. I'd be too excited about a deer to call anyone to remove it! What a beautiful deer. I know we have some in our area, but they don't come into the subdivision.I'm LOL about what the police told you, they same the exact same thing here when there are reports of bears "Leave it alone & it will find it's own way back where it belongs"
I so glad he left on his own. I bet he was scared.